The Multiversity- Pax Americana #1. Grant Morrison- Writer, Frank Quitely- Artist, Nathan Fairbairn- Colorist. “Qui custodiet, qui custodien?” “Pax Americana.” The Comedian is dead. No, wait that’s a different earth- ahem, The President is dead. “Daniel, you are a good friend.” “You’ve made compromises…anxiety attacks, an ulcer, erectile dysfunction…” Where am I? There is a reputation that has built up around Alan Moore and Dave Gibbon’s Watchmen over the years that it is one of if not the best graphic novel of all time. As such, to tread on or over this material again is seen as tantamount to rewriting the Bible or adding fictionalized accounts of “Jesus: The Early Years” to the New Testament. 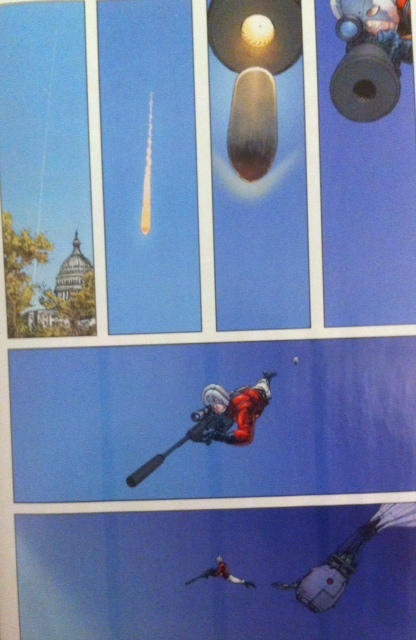 With “Pax Americana” Grant Morrison is getting pretty close. While this story is not Watchmen, it often feels like it is with the Crimebusters recast as their original inspirations- the Charlton Action Heroes. At times there is a clear re-capitulation of themes and elements, and at others it almost seems that Morrison is doing a parody of Watchmen as he seems to point out the notion that a comic can anything something more than a comic. Not in terms of content, but rather the conceit that a comic can be a commentary on comics themselves. However, at the heart of The Multiversity there is the idea that the whole thing is so meta-textual that Morrison himself is doing the very thing. For a musical equivalent see Jethro Tull- “Thick As A Brick”- in one sense a parody of Progressive Rock, which they claimed they weren’t, and at the same time, one of the best Progressive Rock albums of all-time. The story itself in “Pax Americana” is just as complex and broad as Watchmen, at times it feels like he’s distilled the 12 issues into a single oversized special. As with the other issues of The Multiversity, there is a lot to digest in this installment. I hesitate to try and summarize the action of the issue because if I don’t go into detail with every page it won’t really make sense. Instead, I’ll try to hit some of the highlights. The Peacemaker assassinates the President. Oh, yes, he’s also the President’s bodyguard. The Question is involved in solving the murder of the Yellowjacket, the first Super-Hero. (Go back in time and you’ll find Charlton’s first Super-Hero, Yellowjacket starred in his own book for a short time in the mid-1940’s. 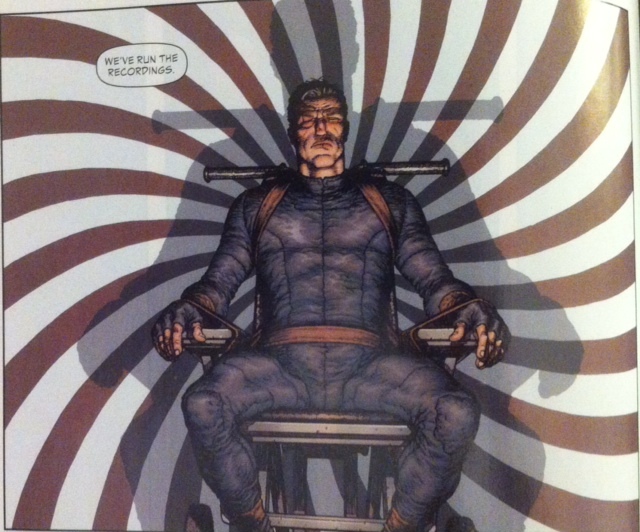 Morrison uses the character’s secret identity and mostly accurate occupation in “Pax Americana.” He changes it slightly so that this character can also be the Joe Orlando character from Watchmen. Oh, what do you mean this fellow must’ve disappeared mysteriously? What, you’ve read Watchmen?) 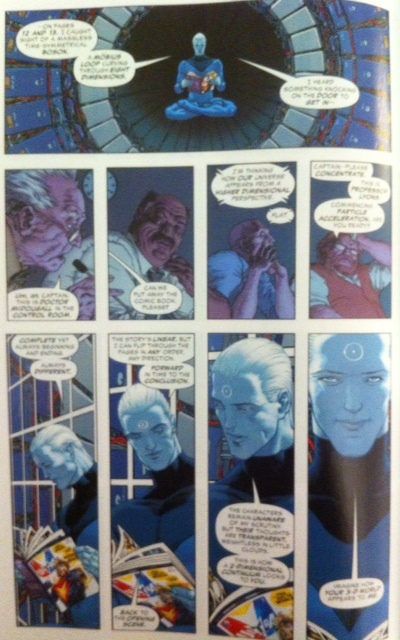 The heavily Dr. Manhattan-flavored Captain Atom is, surprise, also missing or rather in self-imposed exile. Beetle and the Question have a very Nit-Owl/Rorschach relationship. And the depiction of Ted Kord is clearly drawn to look like the actor Patrick Wilson who played Nite-Owl II in Zack Snyder’s Watchmen film. So, who’s the real bad guy? You wouldn’t believe me if I told you. Morrison’s script is a doozy. Quitely’s art is amazing. 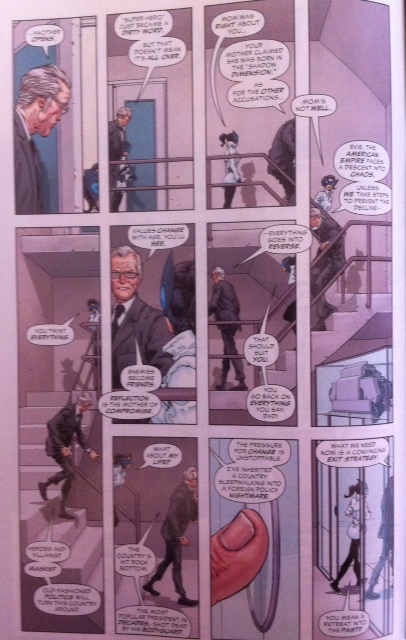 The standout page has to be the one on which Nighshade and her father walk down the stairs and Quitely moves the characters through a stairwell left to right, then down, and right to left and then down and then left to right again. Also, the double-page spread that takes place in the same room at three different and distinct times. The panel layout homage to Watchmen is very effective. The reveal at the end was completely unexpected, much like Ozymandias’ confession at the end of Watchmen, but in a completely different way. Never saw either of them coming. 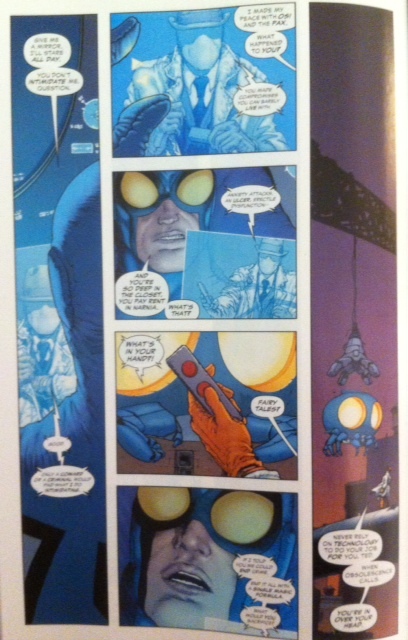 There are Easter Eggs galore for Watchmen fans as Morrison and Quitely work in “Pax Americana” analogues. Despite the quality of this issue it’s really easy to point out one huge glaring negative. This is a riff on Watchmen, and if you were expecting the Charlton Action Heroes in a traditional presentation you will be sorely disappointed. I am sorely disappointed in this as well. As well crafted as this issue is it does nothing to assuage the desire to see a classic take on the Charlton characters. Everyone should read this comic. Period. Every comic fan should read this. It is that well done on every level. However, depending on one’s taste, I don’t think it’s for everyone. Everyone won’t come away liking this issue. Some may actually hate it. I’m not even sure how I feel after two reads. However, I think it is easy to agree that Morrison and Quitely have done a fantastic job at creating a comic book. It’s like reading Will Eisner, love it or hate it you cannot deny the skill at which these creators operate in the art form. It’s that good.